The Pentagon made the announcement on Friday, indicating that two exchange program training exercises involving the United States and South Korean militaries would be put on hold indefinitely. The move comes on the heels of the summit earlier this month between Trump and North Korean leader Kim Jong Un. “To support implementing the outcomes of the Singapore Summit, and in coordination with our Republic of Korea ally, Secretary Mattis has indefinitely suspended select exercises,” Pentagon spokeswoman Dana White said. “This includes suspending Freedom Guardian along with two Korean Marine Exchange Program training exercises scheduled to occur in the next three months,” White said. 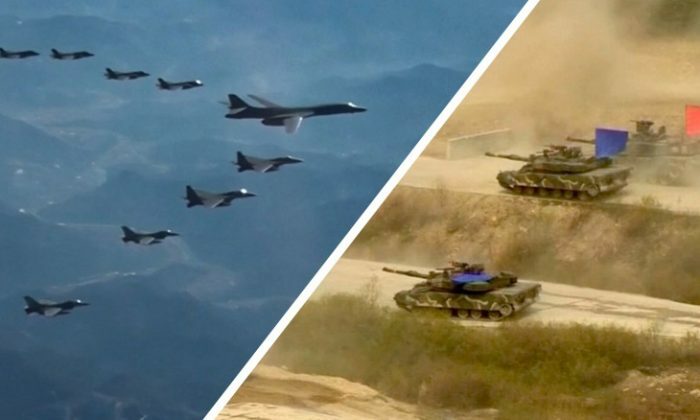 This week, the United States and South Korea said they were suspending planning for August’s Freedom Guardian exercise. Mattis met with Secretary of State Mike Pompeo, Chairman of the Joint Chiefs of Staff Gen. Joseph Dunford and Trump’s national security adviser John Bolton on Friday, White said. “In support of upcoming diplomatic negotiations led by Secretary Pompeo, additional decisions will depend upon the DPRK continuing to have productive negotiations in good faith,” she added, referring to North Korea. At the Singapore talks, North Korea also agreed to allow the recovery of the remains of soldiers who went missing in action during the Korean War. On Saturday, the U.S. military began moving caskets into North Korea for the recovery of some remains, the U.N. Command in South Korea said in a statement.